Two follies have long haunted American policy on Iran. Some critics and foes of the Islamic regime in Tehran have preferred “no negotiation with the regime” as the proper American policy. They have argued that even talking to the regime confers upon it a legitimacy that it does not possess and does not deserve to possess. The regime, this camp claims, is on the verge of collapse, and negotiating with it would only prolong its moribund life. At the other extreme are those who have argued that the regime is in fact legitimate and here to stay, and so have insisted that negotiating with it is the solution not just for the current nuclear impasse but also for all the points of contention between Tehran and the West. If past attempts at negotiation have not worked, these “realists” explain, it has been only because American policy-makers have not tried hard enough. Every president from Carter to Obama has come under criticism from this accommodationist camp for disingenuous or half-hearted attempts at negotiation. Advocates of this approach have shown different degrees of sympathy with, and even outright support for, the regime in Iran. During the Shah’s regime, it was not uncommon for CIA station chiefs in Iran to turn that posting into profits. Kim Roosevelt, sent to Iran in 1953 to coordinate CIA efforts to topple the government of Mossadeq, and Gratian Yatsevich, the CIA station chief in the early 1960s, and Richard Helms, the director of the CIA in the Johnson and Nixon administrations and subsequently the American ambassador to Iran, used their connections with the Shah to great personal profit. After leaving their government jobs, however, the Leveretts made a different kind of gain from their experience. They initially made a name for themselves by harping on what they believed was (in the words of Esquire, which profiled them in 2007) “The Secret History of the Impending War with Iran that the White House Doesn’t Want You to Know.” Since then, aside from launching a website called “Race for Iran,” which has been re-named “Going to Tehran” since their book’s publication, they have also established a consulting firm called Strategic Energy and Global Analysis, with Hillary Mann Leverett as the CEO. The "Roadmap" has given Khamenei's regime a propaganda bonanza. We may more reasonably surmise that it was not deemed genuine because its spirit and its specifics went against everything that the Iranian regime, and particularly Ayatollah Khamenei, had said and done before the miraculous appearance of the “non-paper” in 2003. And nothing in the regime’s behavior in the decade since the disclosure of the “Roadmap” lends it any more credibility. During that same earlier period, moreover, Iran was running covert negotiations with high-ranking American officials and innumerable public meetings with representatives of Germany, France, and England; and more than once the Iranians were told by those various officials, as well as in other meetings with Chinese and Russian officials, that Iran should resolve its tensions with the United States, and that such a rapprochement would make it easier to solve the nuclear issue. So if anyone in a real position of power in Iran was in fact willing to make the kind of concession that the Leveretts allege, would it not have been natural for the edifying “Roadmap” to be handed to one of the officials negotiating with Iran? Would it not have been beneficial to the regime to share it with the Europeans? After all, the unsigned document promises heaven. Yet it was not made public. What has happened is this: its disclosure since then has given the regime and its supporters a propaganda bonanza. On the basis of this allegedly unimpeachable source, Tehran may claim that the chance for a “big bargain” was squandered because America was planning an “impending” war against Iran. Enter the Leveretts. In the “Roadmap,” Iran ostensibly agreed to “full transparency for security that there are no Iranian endeavors to develop or possess WMD…. decisive action against any terrorists…. coordination of Iranian influence for actively supporting political stabilization and the establishment of democratic institutions and a democratic government representing all ethnic and religious groups [in Iraq]…. acceptance of the two-states approach [in the Palestinian-Israeli conflict]…. action on Hezbollah to become an exclusively political and social organization within Lebanon.” As I say, heaven. In return, the Roadmap asked for an end to American sanctions, a promise that the United States refrain “from supporting change of the political system” in Iran, “action against the MEK [a group that has been fighting the Iranian regime first through acts of terror, then through cooperation with Saddam Hussein, and has only been recently de-listed by the State Department as a ‘terrorist organization’],” and, finally, the “recognition of Iran’s legitimate security interests in the region,” and its “national interests in Iraq.” This single incredible piece of paper was supposed to transform the Bush administration’s thinking? The Bush administration may certainly be criticized for what was at best an erratic policy on Iran—it swung fitfully from neo-conservative jingoism to benign neglect when Halliburton’s subsidiaries continued to work in Iran in spite of American sanctions—but its incredulity about the “non-paper” can be attributed more to realism than to any of the secret machinations described by the authors of Going to Tehran. Even the Leveretts seem somehow to know this. To make the “Roadmap” believable as a serious offer, they have decided to debunk what they call the three existing myths about the regime—“the irrationality myth,” the “illegitimacy myth,” and the “isolation myth.” In the course of this “demolition,” they also attempt to debunk the “myth” that there is a legitimate democratic opposition left in Iran. They also dismiss the “myth” that the election in 2009 was rigged. It turns out that nothing Iranian is as it seems. Like the public relations firm hired by the Assad regime to create a warm, enlightened image of Assad, the Leveretts wish to show what they think is the “real” Iran: a democratic government, popular at home and abroad, peaceful in its policies, and maligned in the media because it stands up to the West and its allies. They accuse a whole array of institutions and individuals—from think tanks and media outlets who have interviewed anyone critical of the regime to Nobel Laureates and “expats” and scholars “with an agenda”—of complicity in a conspiracy to hide the “real” Iran. With the help of their “interlocutors” in Iran, the Leveretts have taken upon themselves the Herculean—or should I say the Orwellian—labor of setting the record straight. When Going to Tehran describes Iran, it often reads like a reincarnation of the sad Soviet-era tradition of “Potemkin village” panegyrics. (Dictionaries define the term “Potemkin village” as an “impressive façade or show designed to hide an undesirable fact or condition.”) As with all “Potemkin village” narratives, what the Leveretts say or write is intended not only to change opinions in the West but also to play a critical function in Iran. What the couple says is invariably picked up by sites and papers close to the regime in Iran, creating an echo chamber where the lunatic fringe in Iran is assured that high-ranking U. S. officials affirm the legitimacy of the regime’s position. The Leveretts rightly dismiss the view of the regime in Tehran as composed only of suicidal messianic zealots, yet there is, ironically, a strong messianic subtext to their own narrative. By their reckoning, every American administration since Carter, the British and French governments, Israel, the IAEA (which has referred Iran to the United Nations), the UN (which has imposed sanctions on Iran), the Western media, all the Iranian scholars, activists, writers, poets, politicians, and past IRGC commanders who reject the status quo, the political prisoners in Iran who defiantly smuggle letters out of prison and describe the brutal nature of the despotism in today’s Iran—all these people have got it wrong. Only the Leveretts accurately understand the nature of the regime in Iran and only they have the solution to the quandary of American-Iranian relations. The problem is that virtually all their knowledge about Iran comes from what they call their Iranian “interlocutors,” or high-ranking Iranian officials, or their friend and occasional co-author Seyed Mohammad Marandi, whom they introduce as “a scholar well connected with Iranian foreign policy circles.” In truth, Marandi is not just himself a polished ideologue of the regime, but through his father—a physician to Khamenei—he is connected to the very center of power. The Leveretts quote Marandi, Jr. about how changes in the region—the popular revolts of the Arab Spring—are vindicating the Islamic regime, a perverse view often voiced by Khamenei and seconded by the Leveretts. It happens that, by mere coincidence, Marandi, Sr. and a small group of other Islamic Iranian “sages” just wrote a letter to President Morsi of Egypt offering him advice on how to follow the Iranian model of governance. The letter has been met with scorn by virtually every political group in Egypt, all of whom accuse Iran of meddling in Egypt’s internal affairs and insist that following Iran’s failed model is not the proper course for the new Egypt. Moreover, when Ahmadinejad—the man whom the Leveretts praise as one of the most “popular” politicians in the Muslim world—traveled to Egypt a few weeks ago, his Egyptian hosts repeatedly humiliated him. Shoes were thrown at the Iranian president, and even the Grand Mufti of Al-Azhar, Egypt’s most influential center of Islamic learning, did not participate in a joint conference with him. The ruling Muslims in Tunisia, the Muslim Brotherhood in Syria and Jordan, and of course the ruling Muslim party in Turkey, have all repeatedly made it clear that they want nothing to do with the Iranian style of government. The aversion of Muslims—even religious Muslims—to the Iranian model is not hard to understand. In its measures of corruption, its number of executions, its “brain drain,” its per-capita rate of drug addiction, and its number of journalists in prison, Iran consistently ranks amongst the worst countries in the world. In a number of ways, Iran consistently ranks amongst the worst countries in the world. The Leveretts go on to suggest that, for Iranians, Ahmadinejad is part of a new generation of conservatives—“Iran’s ‘greatest generation.’ ” As the prime organizations “interrelated” to the “greatest generation,” they mention the Iranian Revolutionary Guard Corps (IRGC) and the Basij, the paramilitary citizen militia. It is a little shocking to see these organizations written about admiringly, if we remember how both groups were used to suppress peaceful demonstrators brutally. But more to the point, in recent months, and more than once, Ahmadinejad himself has accused the IRGC and the Basij of all manner of corruption, even referring to them as “brother smugglers.” The Leveretts’ book was already in print when their chosen representative of the “greatest generation” picked the infamous Judge Said Mortazavi, who is under indictment for many crimes, to run Iran’s Social Security Organization. In recent weeks Ahmadinejad has accused the IRGC and its allies of attempting to “engineer” the upcoming elections, and in response leading members of those organizations have admitted that such “engineering” is much in line with the mission of the IRGC. The Leveretts make almost no reference to the essential fact that the IRGC and the Basij have come to control more than half of the economy of Iran, by means of no-bid multi-billion-dollar contracts and shell companies set up to bypass the sanctions. Many of their leaders have accumulated wealth beyond their dreams of avarice. The Leveretts also fail to mention that many other members of this “greatest generation” of conservatives in the current parliament have accused the Ahmadinejad administration of being “the most corrupt” in the history of the Islamic republic. Some have even called it the most dangerous threat to Islam since the religion’s inception. You will not learn from the Leveretts that their hero of the “greatest generation” is now accused by his erstwhile allies of squandering some sixty percent of Iran’s total oil and gas revenues. Even a cursory glance at the media inside Iran—belonging to different factions in the regime—will reveal the depth of corruption, the economic failure, the factionalism, the discontent, and the lawlessness among the elite. Events since the publication of Going to Tehran have not been friendly to its message. Tensions between Khamenei and his hand-picked president have broken into open hostility. Many in the “greatest generation” have not only admitted to having “helped elect” Ahmadinejad president in 2005 and 2009, but have also threatened to take him out with the same sword that they used to suppress the regime’s opponents. The Leveretts wax eloquent about the legitimacy of the election in 2009, and willfully overlook the fact that the headquarters of Hussein Mousavi, the insurgent pro-democratic candidate, were ransacked by officials of the Intelligence Ministry shortly after the polls closed, and that all its computers, in which data from exit polls were being collected and tabulated, were confiscated. And even if we were to accept their bizarre claim that the election results were genuine—and overlook the fact that some statisticians using sophisticated models concluded that the results could only have been random numbers and not real results—the fact remains that even according to the official results Mousavi received close to fourteen million votes. Yet he, his wife Zahra Rahnavard, and Mehdi Karubi, the other “losing” candidate and a two-time speaker of the parliament, have all been under house arrest for about two years—with no indictments and no trials. They were arrested, according the regime’s own spokesmen, by the direct order of Khamenei. And yet the Leveretts maintain that elections in Iran are more competitive and democratic than those in the United States and in much of the world. The Leveretts quote one “defender of the system” who claims that “the overwhelming majority of Iranians” prefer the current system to “secular liberal democracy.” In fact, a critical part of their argument for the legitimacy of the Iranian regime is founded on the axiom that the revolution of 1979 was “inspired and directed” by Ayatollah Khomeini and his theory of Velayat-e Fagih, or the rule of the cleric as the only legitimate power on earth until the return of the messiah. Khomeini, the Leveretts declare, did not “ ‘capture’ the Iranian revolution,” because “there would have been no revolution without him.” The fallacies—the errors of omission and commission—in those few lines are many. The tumult that eventually led to the revolution in 1979 was first inspired not by Khomeini but by Jimmy Carter and his human rights policy; it was exacerbated by the last-minute attempt of the dying Shah to change his authoritarian regime into a more democratic polity, and by an opposition that mistook Khomeini for a new Kerensky. It was only after the movement for democratic and human rights began, as writers gathered in the Goethe Institute in Tehran and protested government censorship in front of thousands, that Khomeini fully realized the democratic nature of the movement. The Iranian revolution was conducted in the name of freedom, dignity, and independence, and not for a government where one man claims to represent the voice of God. Only regime apologists dispute this fact. Much of the Leveretts’ defense of the regime borders on the absurd. Khomeini was nothing if not astute. In the months leading up to the revolution, as he was emerging as a de facto leader of a movement without a leader, he never once mentioned his intention to create God’s government on earth. Instead he promised something very close to liberal democracy. Indeed, the first draft of the constitution developed for post-revolutionary Iran and approved by Khomeini was modeled on the secular democratic Fifth Republic of France. Khomeini more than once declared that no clergy would assume any position of power. He promised there would be no coercive methods used to force women to wear Islamic veils. He lied. His charismatic and unbending leadership was certainly a significant element of the revolution’s victory, but he neither “inspired” the revolution by himself nor was honest with his people about what his intentions really were. To validate the clerical power grab in 1979 and since, the Leveretts claim that the “logic of the secularization hypothesis” is not commensurate with the spirit of the Iranian people. Never mind the insulting nature of such a claim. Never mind also the fact that it is not clear who gave the mullahs or the Leveretts the mantle of speaking for the Iranian people. The larger truth is that even a cursory look at Iran’s modern history—from Amir Kabir and the rise of social and religious movements in the mid-1850s to the constitutional revolution of 1905-1907, and Iran’s democratic interlude from 1941 to 1953, and finally the tumult before and since the revolution in 1979—shows that secular liberal democracy has never been far from the center of political discourse in Iran. The logic of secularization has been the logic of Persian and Iranian politics throughout the modern era. To further their claim that the Iranian regime is in its own way democratic, the Leveretts assert that all important political positions in Iran are “popularly accountable in some fashion.” They give as their example “the leader [now Khamenei]” who is “not directly elected but is chosen by the Assembly of Experts, which is directly elected to an eight-year term and constitutionally mandated to oversee him.” This is indeed the letter of the Constitution, but the Leveretts cunningly overlook the fact that after 2009, when there were murmurs that Ali Akbar Hashemi Rafsanjani, the head of the 86-man Assembly of Experts, might move to exercise some oversight over the Supreme Leader, clerics close to Khamenei claimed that he is in fact not “elected” by the Assembly but anointed by God, and then “discovered” by the Experts, who must, like the rest of the society, obey his every command. One sycophantic cleric went so far as to claim that at birth Khamenei had begun reciting Qur’anic verses—a claim usually reserved for imams, or Shiite saints. Khamenei and his allies then moved to replace Rafsanjani as the head of the Assembly of Experts, putting in his place a less assertive cleric. More crucially still, the authors seem unaware of the fact that the people’s voice, even when manifest in elections, provides nothing but an “advisory” view to the divinely guided and anointed leader. They overlook the words of Mesbah Yazdi, the cleric closest to Khamenei (and mentioned only once in this book, as someone “frequently described as [Ahmadinejad’s] spiritual advisor”), that Iran should change its name and become an “Islamic Government” (instead of an Islamic Republic) and accept that God is, and the people are not, the sole sovereign. He went on to ask angrily who the people are to interfere in matters of state, and by what right they do so. The people’s only role, he suggested, is obedience. The Leveretts’ apologia for the Iranian regime can be attributed in part to the politics of their “interlocutors.” Judging by their footnotes, virtually all in English, the Leveretts have little knowledge of the Persian language. This also accounts for their exceedingly partial understanding of the Iranian situation. Yet one might still have expected their governmental experience to have left them with a more thorough, informed, and judicious way of describing American policy toward Iran. But here, too, their agenda—that Iran today is like China in 1971 and that it “is time for an American President to go to Tehran”—forces them to offer a one-sided history of American-Iranian relations. Even some in the current Iranian leadership have offered more nuanced narratives of the history of those relations. The Leveretts’ book will appeal to anybody who, under the banner of progressive politics, supports any regime, regardless of how monstrously it behaves toward its people, so long as it stands up to Western, and particularly American, hegemony. Contrary to the Leveretts’ account, and as recently documented by the scholar Mark Gasiorowski, in the months after the revolution Iranian officials “asked US embassy personnel for information on ethnically based uprisings that threatened the new Islamic regime. It culminated when a CIA officer gave two briefings in mid-October warning Iran’s leaders that Iraq was making preparations for a possible invasion of Iran.” These briefings, according to Gasiorowski, “ended abruptly in November 1979, when radical Islamic students seized the US embassy in Tehran.” Iran’s leaders failed to heed those intelligence briefings; and by purging the Iranian military, and taking American diplomats hostage, they made their country vulnerable to the butcheries of Saddam Hussein. The Leveretts rightfully criticize the Reagan administration for not seriously condemning Iraq’s use of chemical weapons against Iran, and for the tragic downing of an Iranian passenger plane by the American carrier Vincennes in 1988, which killed “all 290 civilians” aboard. 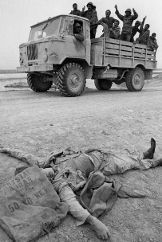 Yet they fail to underscore that in 1982, when Iranian forces had pushed the Iraqi aggressor back to the 1979 borders, some in Iran’s military and political elite told Khomeini that there was no way for Iran to win the war, and that Iran should accept the offer of peace and reparations then on the table. Khomeini refused, insisting that Iran would continue the war until Saddam was destroyed. Six years later, with hundreds of thousands of lives destroyed on both sides of the border, he had no choice but to accept the ceasefire. Saddam was a butcher and an aggressor, and he used chemical weapons against Iran; but the stubborn refusal to heed reality by Khomeini contributed to prolonging the tragedy that was the Iran-Iraq war. In Greek tragedy, peripeteia is the moment of discovery when the hero suddenly realizes that all he thought he had known has been wrong. One can only hope that the Leveretts have their moment of peripeteia and atone for the hubris of speaking with certainty for a people they know little about. Then they might accept that Iran is more akin to the Soviet Union in its dying Brezhnev days than it is to Mao’s China. They might then grasp that there is another possible direction for American policy toward Iran, something other than “going to Tehran” or going to war. In their book, the Leveretts criticize me for advocating what they call “soft regime change.” They correctly say that I have been in favor of direct, unconditional negotiations between Iran and the United States—talks that would involve not only the nuclear issue but also the issues of human rights and democracy—a Helsinki approach, with talk about missiles and bombs in the morning and talk about human rights in the afternoon. They also say, correctly, that I have been against a military strike or a war with Iran, and that I have opposed sanctions “which afflicted all Iranians” and instead favored “smart sanctions” that target the regime and its operatives. What they critically fail to mention is that I have also repeatedly emphasized that bringing democracy to Iran is the responsibility of the Iranian people, that only they can and should decide the future of their country. This is not “soft regime change.” It is a hard defense of the rights of the Iranian people to choose their own government, and a rejection of all self-declared “guardians” of the Iranian people, whether they reside in Maryland or in Tehran. Abbas Milani is the director of Iranian Studies at Stanford University and the author, most recently, of The Shah (Palgrave Macmillan). He is a contributing editor at The New Republic.